High levels of this vitamin will help detoxify the body, rebalance intestinal flora, and strengthen the immune system. Our bodies cannot produce this vitamin so we need to replenish our supply daily. When I started my treatments for my spine, my chiropractor put me on this vitamin, because without it, our bodies cannot make collagen, and collagen is what is needed to maintain strength and flexibility of joints. The picture of the cherries has given you a hint. 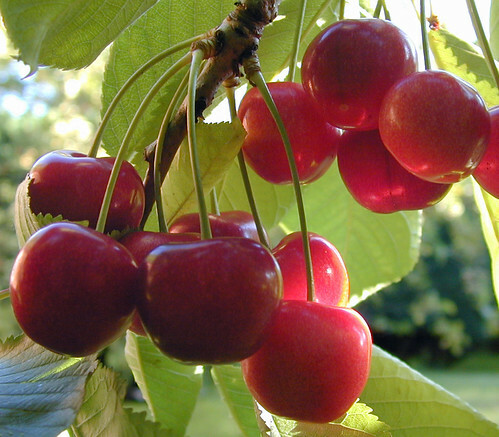 I'm talking about Vitamin C and the ascerola cherry is packed with vitamin C.
In her book, Digestive Wellness, Elizabeth Lipski, (Ph.D., CCN, CHN), describes a technique called Vitamin C Flush that she has used with herself and her children, and with her clients for the past 20 years. Vitamin C has been well researched to help detoxify bacterial toxins, drugs, environmental toxins, and heavy metal toxins. If your immune system is weak, or you have a cold or infection, or you've been exposed to a lot of toxins, you may want to do a Vitamin C Flush once a week for a month or two. On days when you are not doing a vitamin C Flush, take a minimum of 2,000 to 3,000 mg. I personally have done the Vitamin C Flush several times, and I'm currently taking the recommended amount of 3,000 mg. daily. I have found an added benefit to taking this recommended dose, it keeps your system regulated. To do a Vitamin C Flush, take Vitamin C to the level of tissue saturation. You'll know you have reached it because you will have watery diarrhea. You may want to purchase powdered mineral ascorbate C (instead of the ascorbic acid C) which is easily tolerated by most people, because it doesn't change your pH balance. Take about 1500 mg. of Vitamin C powder, mix with water or fruit juice, and drink. Repeat in 15 minutes. Keep taking 1500 mg. every 15 minutes until you have watery diarrhea. As soon as watery diarrhea is produced stop taking the Vitamin C.
Keep track of how much Vitamin C you have taken. This will help determine your optimal dosage. In divided amounts, take daily one-half to three-quarters of the amount it took to produce the Flush. Over time your needs may increase but then substantially decrease as repair occurs. Adjust your dosage accordingly. I met Dr. Lipski and have a signed copy of her book, Digestive Wellness. I highly recommend it since it gives a great understanding of how the gut works and ways to optimize quality of life. Many digestive problems are addressed with recommendations of how to bring about a cure.